Invasive treatments such as surgery or radiotherapy for localised prostate cancer compromise quality of life whilst offering minimal overall survival advantage at 10 years of follow-up. Evaluate the feasibility of objectively monitored exercise training (ET) as a novel primary therapy for low and intermediate risk localised prostate cancer. A multi-site open label RCT recruited men on active surveillance for low or intermediate risk prostate cancer. Participants were randomised to either ET or usual care with physical activity advice (UCwA). Feasibility included eligibility, recruitment, trial retention, ET adherence and adverse events. Secondary outcomes included cardiovascular health, quality of life and safety biomarkers. According to CONSORT guidance quantitative data were analysed descriptively and qualitative data thematically. 50 men (median age: 67yrs) were randomised to ET (n=25) or UCwA (n=25). 92% (n=46) men completed 12 month assessments. In the ET group, men completed mean: 140 mins per week for 12 months (95% CI 129,152mins) (94% of target dose) at 75% Hrmax. No serious adverse events were recorded. ET improved body mass (mean:-2.0 kg; 95% CI -2.9,-1.1) systolic (mean: 13 mmHg; 95% CI 7,19) and diastolic blood pressure (mean:8 mmHg; 95% CI 5,12) and quality of life (EQ5D mean:13 points; 95% CI 7,18). Three men underwent invasive therapy of which two were randomised to UCwA. Objectively monitored ET as a novel primary therapy for men with localised prostate cancer demonstrated excellent feasibility and encouraging impacts on clinically important outcomes. Definitive data on long-term clinical and cost effectiveness is required. 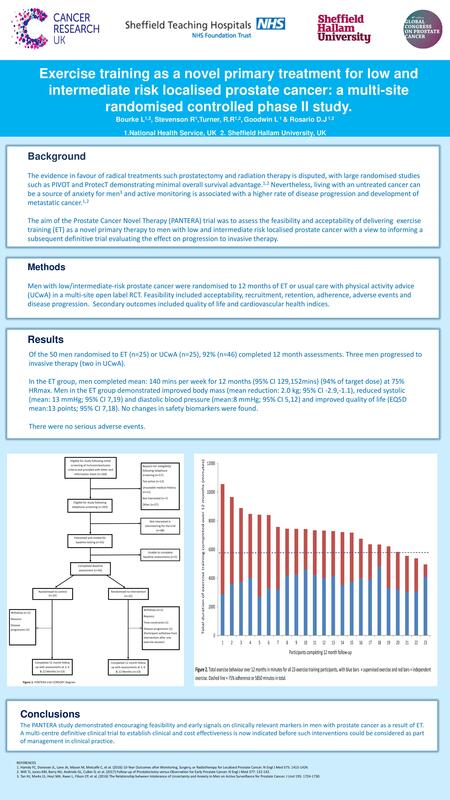 Patient summary: Exercise training for men with localised prostate cancer looks like a promising intervention in this early stage trial. Evaluation in a larger trial looking at its long-term effect on cancer progression is required. Prostate cancer, aerobic exercise training, feasibility, localised disease, active surveillance.